In ΔABC let I be the incenter. Prove that the circumcenter of ΔBIC lies on AI. 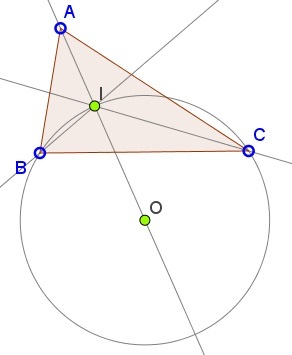 I is the meeting point of the angle bisectors of ΔABC. In particular, AI is the angle bisector of ∠A. 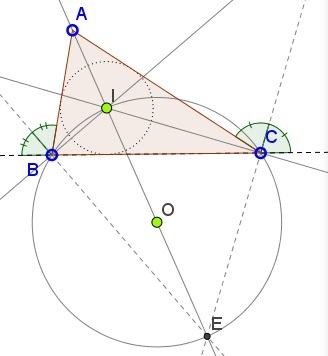 The excenter E opposite A, is the point of concurrency of AI and the exterior bisectors of angles at B and C.
The latter are perpendicular to the angle bisectors BI and CI so that the quadrilateral BICE is cyclic and IE is a diameter of its circumcircle. Naturally, this is also the circumcircle of ΔBIC. Its center is the midpoint of IE and since A, I, and E are collinear, the conclusion follows. It is also clear that the circumcenter O of ΔBIC lies on the circumcircle of ΔABC.